Randa Participates in "Take Our Daughters And Sons To Work Day"
FOR IMMEDIATE RELEASE New York, NY (June 23, 2016) - Randa participated in this year’s national “Take Our Daughters And Sons To Work Day”, held on April 28th. The company’s New York and New Jersey offices hosted 20 children at their parent’s offices. The children benefited from a full day of fun and educational activities, and gained an understanding of their parent’s jobs and work environments. 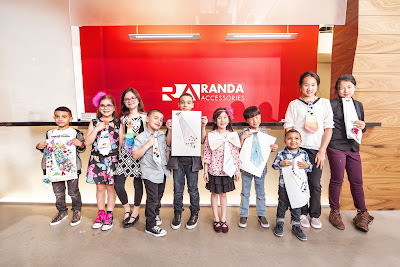 Family activities included designing and building a tie, touring Randa’s offices, learning about departmental functions, and a field trip. Randa supports a culture that enriches their associates personally and professionally. “Take Our Daughters and Sons to Work Day” is a unique opportunity for the company to do so while investing in future generations. This event is part of Randa’s investment in an inclusive, rewarding and leadership-driven culture. Randa provides Leadership Circles, an educational program empowering associates with skills crucial to leadership. The company holds annual off-site meetings for managers, and regular Town Hall meetings provide all associates with the opportunity to engage with senior leadership. Further, Randa gives back to our local and global communities and encourages associates to do so, as well. Outreach programs including Toys for Tots, Volunteers of America, Mercado Global, Safe Passage, and Maryville Academy, along with HIV/Aids walks, and local soup kitchens. For more information about Randa’s culture, community outreach and employee activities, please contact VP of Talent, Chris Ingram, ingramc@randa.net. Watch the Randa TODASTW video below or click here. Randa produces men's belts, small leather goods, neckwear, luggage, casual bags, jewelry, and seasonal accessories including footwear, hats, gloves, and gifts, bringing these to market through all channels of distribution, worldwide. More than the world’s largest men’s accessories company, Randa uses its scale and expertise to create and expand powerful brands, exceptional products and extraordinary shopping experiences. For more information: www.randa.net. The Take Our Daughters And Sons To Work Foundation is dedicated to developing innovative strategies and research-based activities in informal educational programs that empower girls and boys in all sectors of society to confront and overcome societal messages about youth so they may reach their full potential and live fulfilling lives. Through its leadership, expertise, and collaborations, the Take Our Daughters And Sons To Work Foundation advocates for changes in social policy and public awareness on behalf of youth.